Fall is almost here! Get this Personalized Pumpkin Vinyl (Set of 2), on sale for $5.99 (Retail $11.99). 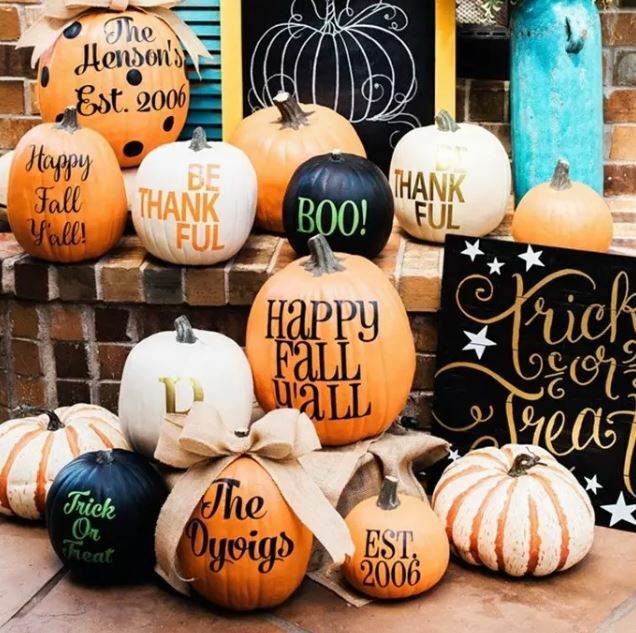 -You will love these personalized decal's to spruce up your pumpkins! They make decorating a breeze! -We attached our decals to artificial pumpkins (hobby lobby has them!) so that they will last year after year, you can or you can use regular pumpkins! -Our transfers are made using professional grade outdoor material so they are made to last! The standard color is Black but we do have some offerings in gold/lime/white. See the coordinating design # to find the best design for you. -We have 24 design options some are repeated designs in different colors. Find the design you like best, choose that design then repeat the process for Design option two. NOTE: IF you are wanting a last name and an established date, that is two options. Also NOTE: If the design is not personalized (Boo!, THANKFUL, Happy Fall Y'all) then put n/a in the personalization field. We will not add personalizations to the designs not including personalization. Shipping is $2.99 for the first item and $0.99 for each additional item.